This product is meant for TPT Sellers. It contains my artist file and 6 sets of Desktop backgrounds; each set has a basic desktop background image that does not have the monthly calendar, along with 12 dated monthly calendar background images. 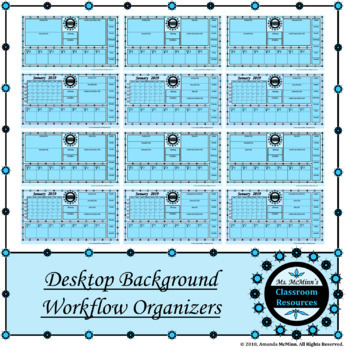 Each set of desktop backgrounds has dedicated space for organizing your files. Just choose the set that works best for you, save the desktop that works best for you, and begin organizing your desktop! If you have any requests, please leave me a message in my Q&A, and I will see if I can add it to the product for you! Due to the fact that most people will only need to use one of the sets of desktop backgrounds, leaving the rest unneeded, I decided to set the price to reflect that. This product will be updated yearly with the upcoming year’s calendar, so once you purchase it, you can download your new set each year! The PNGs contained in this product are meant for personal use only, and they are not to be incorporated into other products. They are not meant to be used as ClipArt, they just needed to be in this format to save them as desktop background. (Note: My other products that contain ClipArt are still considered o.k. for commercial use, this product is an exception.) Thank you for understanding.